Monégasque (natively Munegascu) is a variety of Ligurian, a Gallo-Italic language spoken in Monaco as well as nearby in Italy and France. Monégasque is officially taught in the schools of Monaco and spoken by a minority of residents and as a common second language by many native residents. In Monaco-Ville, street signs are printed in both French and Monégasque. Forming a part of the Western Romance dialect continuum, Monégasque shares many features with the Genoese dialect. Though similar to the dialect of Ventimiglia, it does differ from the Menton's dialect. It shares similarities also with the Niçard dialect of the Occitan language. Monegasque, like all other Ligurian language variants, is derived directly from the Vulgar Latin of what is now northwestern Italy and southeastern France and has some influence in vocabulary, morphology and syntax from French and related Gallo-Romance languages, but most words are derived from Italian. Before the annexation of the County of Nice to France in 1860, the Niçois spoke a dialect very similar to Monégasque. It is spoken in addition to French by Monégasques, mostly within the small nation of Monaco. Because Monégasques are only a minority in Monaco, the language was threatened with extinction in the 1970s. However, Monégasque is now being taught in schools, and its continuance is regarded as secured. 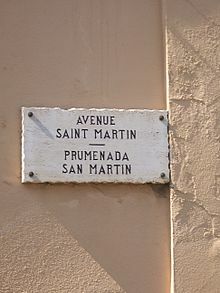 In the old part of Monaco, street signs are written in Monégasque and French. Monaco and Menton constituted the extreme western area of the Republic of Genoa (demarcated in green) in 1664. Standard Italian is also a major language in Monaco. Italian nationals make up some 20% of Monaco's 35,000 permanent residents. Italian was the official language of Monaco when it was a protectorate of the Kingdom of Sardinia, from 1814 to 1861, leaving a legacy in some Monégasque words. Indeed, for a long time after the Renaissance, Monaco was the most westerly part on the Mediterranean coast of the Republic of Genoa. During the fascist occupation in 1942–43, the Principality of Monaco was incorporated into Italy and Monégasque was again considered a dialect of Italian. After World War II there were nearly 10,000 Italians in Monte Carlo, and some of them (descendants of the followers of Giuseppe Garibaldi, who were forced to move from Nice to the Kingdom of Italy after 1861) even spoke Monégasque fluently. ⟨ü⟩ represents [ʏ], as the French ⟨u⟩. ⟨œ⟩ represents [e], as the French ⟨é⟩, not the French ⟨œu⟩, as in bœuf, which is how it is pronounced in Ligurian, which also uses the character ⟨ö⟩ to represent the sound. ⟨ç⟩ represents [s], as the French ⟨ç⟩: tradiçiùn comes from the Latin traditionem, not from the Italian tradizione. Below is an excerpt from the Monégasque national anthem, written by Louis Notari. In addition, there is an older French version of the anthem; its lyrics have a different meaning. The choice between the two forms is generally subject to the occasion and the circumstance. ^ Hammarström, Harald; Forkel, Robert; Haspelmath, Martin, eds. (2017). "Monégasque". Glottolog 3.0. Jena, Germany: Max Planck Institute for the Science of Human History. ^ Gubbins, Paul; Holt, Mike (2002). Beyond Boundaries: Language and Identity in Contemporary Europe. Multilingual Matters. p. 91. ISBN 978-1-85359-555-4. This page was last edited on 18 March 2019, at 02:05 (UTC).